Nairo Quintana (Movistar) has won his second stage ever at the Tour de France on a day that suited his characteristics as a climber. The rider started on the race with the intention of fighting for the General Classification, but things have been difficult for him and his team. "It has been a great day for me, a day that I had marked and everything turned out the way I expected," he commented. "It's a shame that the days before I didn't feel optimal and the time loses were very bad for me. "I feel good for what's left of the Tour and like I always say we keep believing. We need to make the race fast and difficult. The third week has been good for us and we hope to keep fighting." Quintana had the support of his teammates to claim this victory. "Today it was perfect, we had Alejandro (Valverde) in front and he could help me for a while, we also had (Marc) Soler in front and he helped to set a high pace in the peloton to make the race more difficult," the Colombian explained. "We knew that it was a stage for the pure climbers and we have shown that this is our terrain." Like it has happened in all the stages, many Colombians were supporting the country's riders throughout the route. 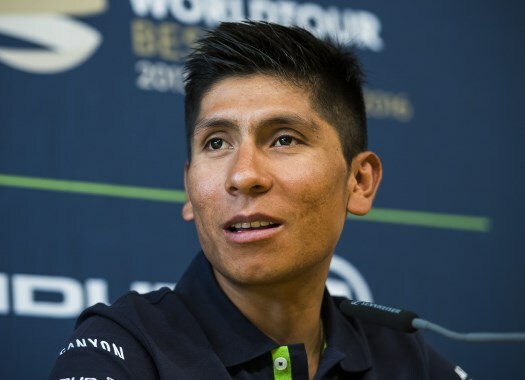 "To be in front of all these Colombians is very exciting and I feel their support in my heart," Quintana confessed. "They are always present everywhere I go. They also send messages through social media and it is very nice for me and that gives me the motivation to give everything on the road."